ST. LOUIS, MO – Show me the money! The people of the United States outcry for fiscal responsibility has reached the breaking point and Washington is attempting to track down where the Troubled Assets Relief Program (TARP) money has gone. Looking west, they found some of it. 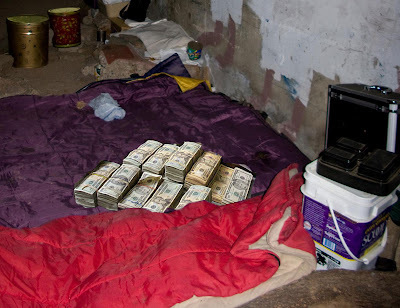 Congressional Auditors located a portion of the 700 Billion dollars financial bailout money living under a dank, I-70 overpass east of St. Louis. The money, dirty and disheveled, looked to have been there for about three weeks. There were urine stained bill wrappers and broken rubber bands cluttering the ground. Some of the bills had been folded down the middle for use at a Gentleman’s Club. There was an overriding odor of MD 20/20 and pennies. The money was unwilling to leave the overpass and unresponsive to our reporter's questions. Back in Washington, we attempted to question several of the major banking institutions. Bank of America’s representative was unrepentive, “Do you know how much money goes in and out of our doors everyday? We can’t be expected to keep track of all of it.” When we described condition of the found money, Bank of America smirked and said that sounded a lot like Wells Fargo’s kind of stash. Wells Fargo said it can't provide any details about any mishandled funds until it releases its fourth quarter statement, though the bank said it intends to check into the found money and what nudie bars the money might have patronized. J.P. Morgan Chase’s representative was unavailable while doing his own research off-shore. 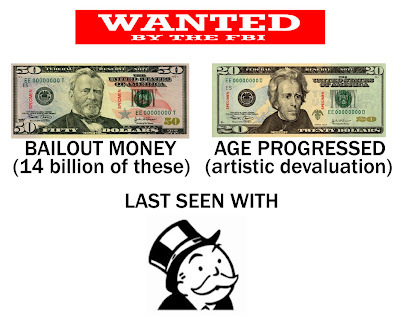 The FBI has been aware of the found money and has put out a poster in the hopes of attracting some attention and developing some leads. As for the bailout money found under the overpass, other destitute also living there said that the money has since moved on and was last seen hitchhiking south on Interstate 55.